Other names: Appleberry, purple apple berry. Climbing blue berry is a native of Tasmania and has been in cultivation for more than 200 years. It has gradually reached other parts of the world including United Kingdom and USA. 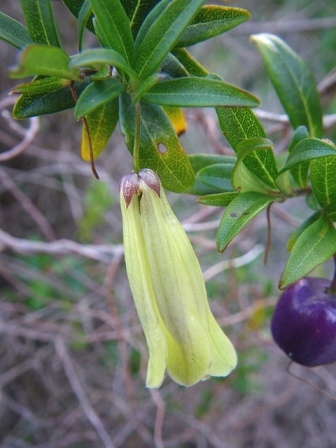 It is grown in gardens for its beautiful flowers and colored fruits. Plants are happy to scamper over walls or fences. As they are not heavy, so they are at ease growing among taller shrubs. A small, evergreen climber, 1-3 m tall. Leaves sessile, linear with entire margins, 0.3 cm wide and up to 2 cm long, alternate, pinnate venation, dark-green above, paler beneath. Flowers solitary, long stalked, creamy-white, sometimes purple-flushed, tubular bell-shaped, 2 cm long: flowering in late spring or early summer. 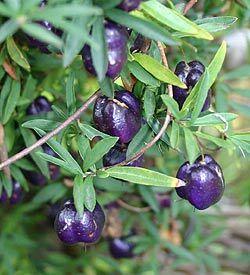 Fruits oblong, up to 2.5 cm long, varying in colour from shades of purple through rose to pure white, aromatic, mealy and pleasant in taste. The fruits are seedy but edible. Their taste resembles somewhat like that of apples and hence the other popular name apple berry. 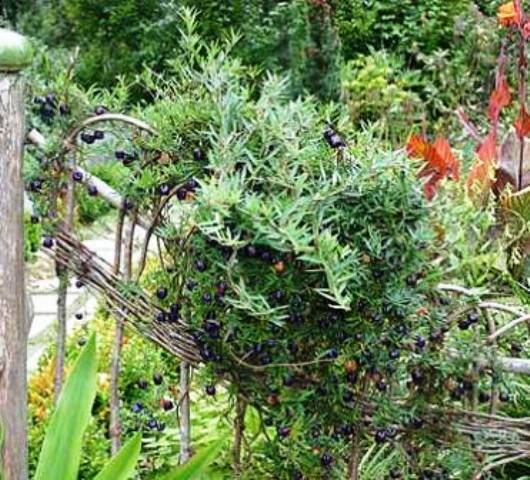 Climbing blueberry is not grown for its fruits but it is good plant for planting in the gardens. It is a very ornamental plant. The flowers are deliciously scented. New plants can be raised from seed which should be sown immediately after extraction. The fresh seeds will germinate in 15-20 days, but if once allowd to dry, and then they might take several months to come out. The germin ation of fresh seeds is prolific. When the seedlings are large enough to handle, prick the seedlings out into individual pots and grow them on in the greenhouse for at least their first winter. Plant them out into their permanent positions in late spring or early summer, after the last expected frosts. This plant can also be propagated by cuttings and layering. Climbing blueberry requires a moist well-drained humus-rich lime-free soil in a sheltered position. Plants are hardy only to about -5°C. Plants like higher organic soils with moderate moisture, but not wet feet. An acidic soil is desirable and, by all means, keeps their roots cool under hotter summer days. As already stated, climbing blueberry is suitable only as an ornamental plant in the garden. It does not have scope for being cultivated for its fruits.